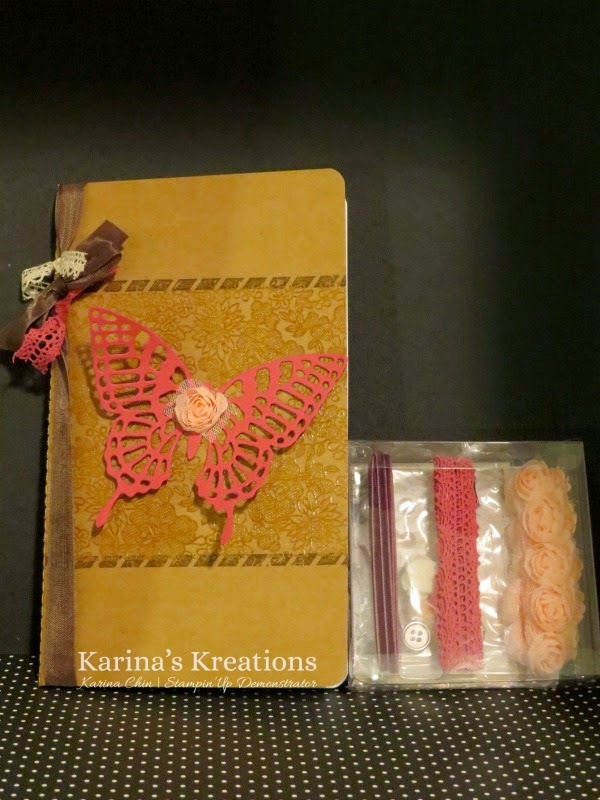 Karina's Kreations: Butterfly Basics Kraft Journal! If you like to give little gifts, I recommend buying a few of these Large Kraft Journals #137865 $4.95. They are easy to decorate and fun to make. I stamped the new Something Lacy stamp set with Versamark ink on the Kraft journal and embossed it with clear embossing powder. The border stamp is from the Butterfly Basics stamp set. The image was stamped with Soft Suede ink. I used Rose Red card stock and the Butterfly Thinlits die to make the butterfly. The embellishments are from the Artisan Embellishment kit.